My items will go live at around 12 o'clock eastern standard time. There will be covered sea stones, missing pieces stones including the ability to have one custom made for you or someone special. This also marks the introduction of the first natural dyed hand crocheted bamboo stones. These are amazing!!! these ones were dyed with teal, brazilwood and logwood. Please check out all the beautiful hand made articles on the blog. I have posted a preview of some of the things I will be listing tomorrow in my shop with 100% of the proceeds going to Save the Children for their japan relief work. can't wait to fill up the pages with experiments!! Hope springs eternal is what this next photograph of my garden reminded me of. Oh and last but not least a little preview of a few of the stones I have made for the crafting for courage sale in my etsy shop that starts on thursday. I will be unveiling some extra special pebbles tomorrow. In japanese culture the dragonfly symbolizes courage, strength and happiness. It seemed like the perfect symbol for a small group of friends to do a little something to help with the relief effort. We organized an event this week to sell items in our etsy shops, on our blogs or to our friends with 100% of the proceeds going to Save the Children for their work with the littlest ones in the devastated areas of northeastern Japan. I will have some crochet covered stones and even at least one missing pieces stone in the shop. All proceeds from photographic prints sold during the rest of the month will also go to that same charity. Joanie used my dragonfly and the rising sun image to make a banner for our project. The other members of the group, so far, are sonia, nanou, jill, lisa and patricia. If anyone wants to join us, please do. preview of the etsy shop update tomorrow, originally uploaded by knitalatte11. The apology is that I have to postpone my etsy shop update for a week. I have been enjoying the last few warm and sunny days of autumn while the leaves are still magical. At the same time I am creating a studio area in my home and thus things are a little topsy turvy right now. Instead of a shop update I have decided to hold a giveaway. Please leave a comment about something you have observed in the natural work where you live this week. I will pick a winner on wednesday at 7 am EST. The prize is a crochet covered stone and a handstitched denim and hand dyed linen bowl. I will mail it anywhere in the world. While the paint was drying I was out enjoying the forest today. Whoever said weekends are for relaxing definitely didn't have my weekend in mind. It is only just after 8pm on a Sunday evening and I am all tuckered out. I was actually feet up on the couch reading Outlander and I could feel my eyelids getting heavy and then they were shut and I almost dropped the book. Not going to bother you with all the busy stuff but I just wanted to share a few moments from the weekend with you before I take a hot bath and get some sleep. Deborah took those lovely supper in the backyard pictures. I adore the one with Edgar wandering in the background. Dinner was Chilean chicken and corn chowder with garlic toasts. It was delicious. I want to thank amy for the cuff I have wrapped around one of the Lake Huron stones. She saved the fabric that wrapped a stone she purchased from my etsy shop and made a perfect cuff with it. She makes beautiful cuffs and sells them in her etsy shop. Which reminds me I need a little etsy motivation so I am setting a date for a big etsy shop update. It will be on Monday, October 18th, time to be determined. 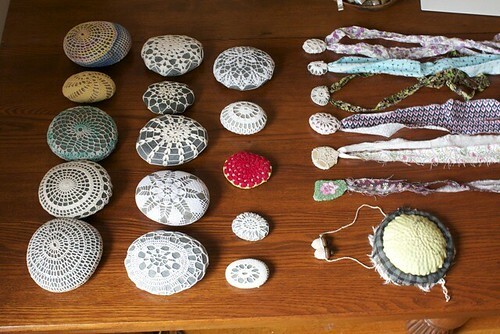 I will have crochet covered stones, necklaces, new prints and even a slow stitched fabric bowl or two. I am also contemplating taking some custom orders at that time for the season of giving. Still in the aqua phase, I have been working on some arrangements for some new prints for the shop. All I need to do is print a few testers and then into the shop they will go later in the week. I might be printing a few larger sizes for my own home, I love them so. A few more close up views of the embroidered detail in the aqua missing pieces stone taken before I wrapped it up and delivered it to Abigail's auntie. If you love summer and hope that it will last forever please excuse this last picture taken on my afternoon walk in the forest. Happy holiday monday for some of us!!! The exact time will be friday, june 18th at 1 pm eastern standard time. The proceeds from this sale will be donated to the canadian wildlife federation for their work in protecting, monitoring and responding to the gulf oil spill. You can see there are a great many sea inspired pieces to be purchased. Hope you can stop by and browse the shop tomorrow.